Two years ago my wife and I purchased our very first home. We have a conventional, fixed-rate 15-year mortgage. Our goal is to pay it off our mortgage in less than ten years. 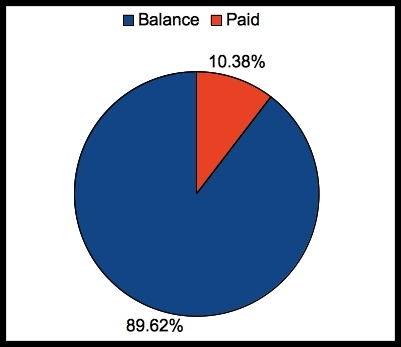 As of January 13, 2011, we have made 22 regular monthly mortgage payments. We have also made several additional principal-only payments. Our mortgage payment is drafted from our primary checking on the first day of each month. Additional principal-only payments are made throughout each month, as we earn additional income and find ways to decrease budgeted-for expenses. The chart shows two percentages. Each month, a little bit more of our regular monthly payment goes towards principal and a little less goes towards interest. Right now, the split is roughly 55/45. Seeing 45% of our payment going towards interest really stinks. That’s why we are so committed to sending extra, principal-only micro-payments. Our mortgage is reduced, dollar-for-dollar. This chart does not represent how much of my house I actually own. It simply reflects how much of our mortgage balance we have paid. We actually “own” much more than 10.38% of the house, based on appraised value and initial down payment. We have made 22 regular payments and have lived in the house for almost two years. Our contractual remaining term is 13 years and 2 months, but our actual remaining term is 12 years and 10 months. We have reduced the length of our mortgage by 4 months! Now that I have a new job, we’re still ironing out the wrinkles in our monthly budget. We’re unsure as to the exact amount we’ll have, each month, for debt reduction. We know that we can’t be as aggressive this year as we were last year, but we are still focused on our goal. Our steps may be smaller, but we’re still headed in the same direction. View all post related to our mortgage payoff progress. Have you looked into the bi-monthly payment plan? Many lending institutions will set you up for the asking. It can cut 7 years off a 30 year mortgage and the bi-monthly will cut down the interest you owe substantially. As a first time home buyer you are to be congratlated for going with a 15 year fixed mortgage. It will make growing your equity that much faster. Your article doesn’t point out where you live but, if it’s the US then you own your home 100%. You may have borrowed money and pledged the house as collateral but it is still yours’ yes, there is a loan to value ratio based on the loan balnce and current value of home but it’s all yours and you can paint it pink if you want. I can’t tell you what a great idea it is to throw your extra dollars at your mortgage as long as you have no other higher interest rate or non-tax deductible debt. Also, you should be maxing out retirement contributions first. Here’s to your achievement. Cheers! It is really heartening to read the way you are reducing the loan burden. It takes lot of dedication and a sense of sacrifice (by not using the extra money for some other purpose). I appreciate your effort and wish you the best! Seriously buddy paying off your mortgage in 10 years would be an AWESOME achievement and I really really hope that you can achieve it. Personally I try and save as much as possible and then pay down extra on my mortgage each month, primarily because I am desperate to move into my later years as free of major debt as possible. Please keep us all posted!